Around here, I change a lot of diapers. In fact, there are days when I feel like that's all I do. I've never been one to have a formal diaper changing station. Needless to say, my changing pads have come in handy. I love that one side wipes clean. This version couldn't be simpler. 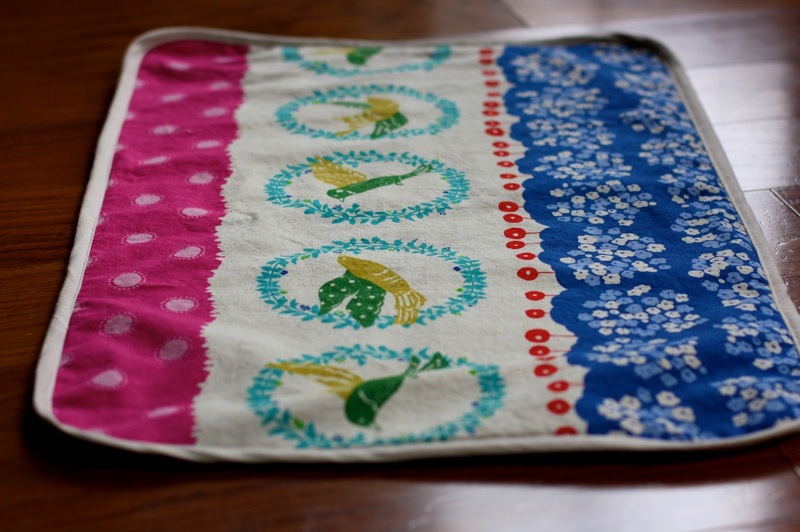 I was recently researching how to make a changing pad that was a little fancier - as a gift for a friend. I looked at tutorials where the pad folds into thirds and fastens. They were nice in theory, but I wondered if the velcro and strap might make the cloth side less usable. 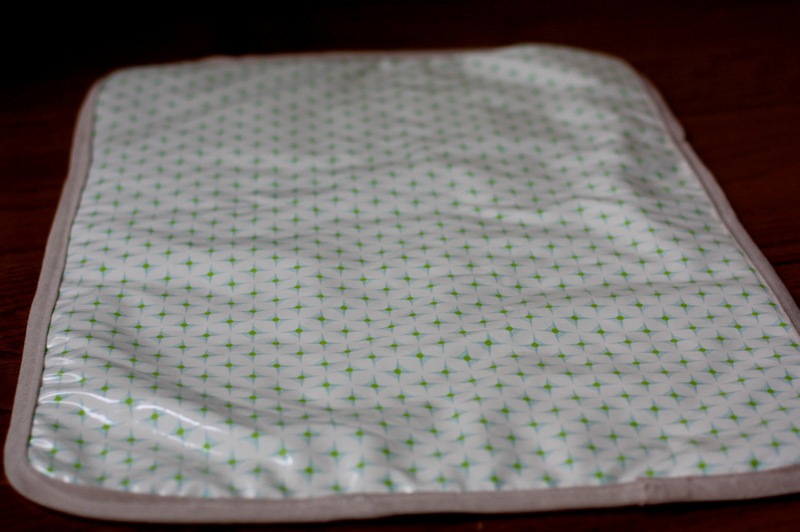 After all, the pad is easy to fold and tuck away without the extra bells and whistles. I considered adding ties so it could be rolled and then tied, but again, that seemed like overkill. Sometimes simple is best. I ultimately decided to just round the corners and add some bias binding. Easy and pretty. Here's how you can make one too. 1/2 yard laminated cotton This will be your wipe-able fabric. 1. Cut your laminated cotton, quilter's cotton (or flannel), and cotton batting to 18"x27". 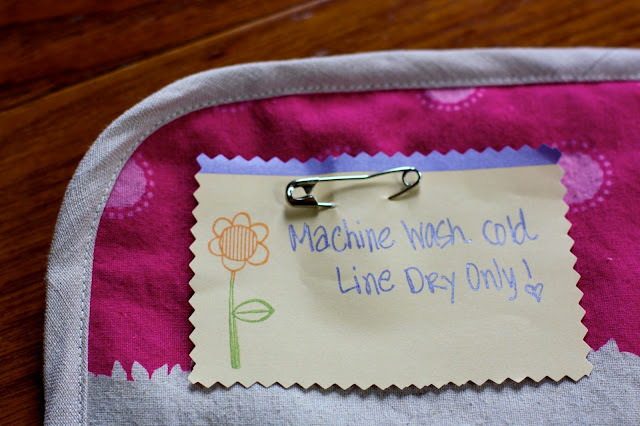 It's important to use 100% cotton for this project since polyester can retain odors. 2. Lay your laminated cotton right side down. Place your batting on top of it, followed by your cotton fabric, right side up. Stack, lining up the edges and smoothing out any wrinkles. Pin and then baste all three layers together 1/8" from the edge, sewing on the cotton (versus laminate) side of the pad. My sewing machine gives me grief when I sew on the laminate side. 3. Using a a dinner plate, cd, or circular item of your choice as your guide, round your corners, tracing them first, then cutting. 4. Now you'll need your bias tape. I like to make my own. You can find instructions on how to do that here. It really helps to starch your bias binding as you iron it. It makes the binding easier to work with. I like to cut my bias binding strips 2.25" wide. Or you can buy your own and skip this step. 5. Attach your bias tape to your changing pad, again sewing on the cloth side of the pad. 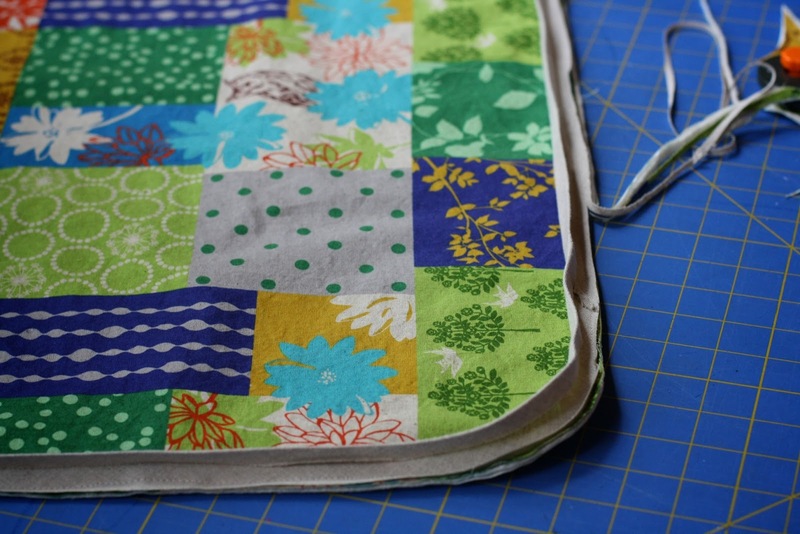 (Here's a great tutorial on attaching bias binding). I didn't want to hand sew the binding to the back of the pad since the pad would be washed somewhat regularly. Machine stitching felt more durable. Yet I'm often unhappy with the appearance of machine-sewn bindings from the back side. I found it helpful to sew one side of the bias binding on, and then trim away the seam allowances, leaving 1/8-1/4" or so, like this. That's it! I hope you enjoy your new changing pad. Making a dirty job a little prettier! my baby won't sleep unless i am holding him so i decided to use his snooze to check out your blog! i love that evie told you she loves you! i love the circle skirt! 31 is soooooooo young! and i'm going to make some of that tea! you are precious!